Paper and paperboard trays have gained wide popularity in flexible packaging applications for food and beverages, consumer durables and electronics, personal care, and homecare and toiletries. Considered as semi-rigid structures, these containers are increasingly in demand for cost-effective applications, especially for the food and beverages and fast-moving consumer goods sectors. The striking sustainability and recyclability of paperboard trays makes them suitable for various packaging applications in the e-commerce sector in various parts of the world. These containers allow amazing grease resistance and moisture barrier, significant sealability, and low pricing. The marked structural rigidity possible with a variety of polymer coating is a notable factor opening up exciting applications of paper and paperboard trays. A number of manufacturers are focused on improving the operational efficiency in the supply chain by adopting innovative technology and material innovations. 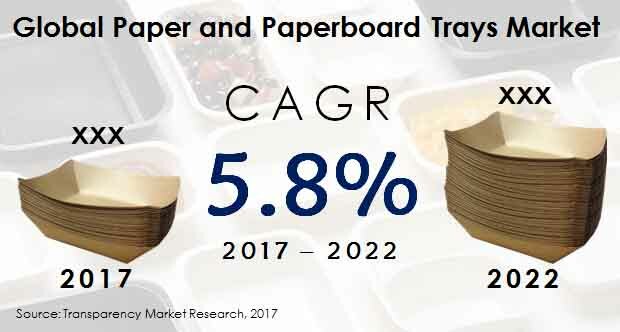 The global paper and paperboard trays market is projected to rise from a valuation of US$4,444.3 Mn in 2017 to reach a valuation of US$5,893.9 Mn by 2022 end. The market is forecast to clock a CAGR of 5.8% from 2017 to 2022. The various materials types used in making paper and paperboard trays are corrugated board, boxboard/carton, and molded pulp. Of these, the corrugated board segment leads, holding a major share 57.5% in 2017, with an estimated valuation of US$2,553.5 Mn. Expanding at a CAGR of 5.5%, the segment is expected to retain its dominance and reach US$3,344.1 Mn by 2022 end, representing the leading share of 56.7%. The annual growth is pegged at US$158.1 Mn over the course of the assessment period, representing an absolute growth higher than all other segments. The vastly rising demand for corrugated boards can be attributed to the marked recyclability of these containers and their versatility of applications. In addition, substantial advancements made in coating technologies also bodes well for the growth of this segment. North America, the Middle East and Africa (MEA), Latin America, Asia Pacific excluding Japan (APEJ), Japan, and Europe are the various regional markets for paper and paperboard trays. Of these, Asia Pacific excluding Japan (APEJ) holds the leading share in 2017, vis-à-vis revenue, and is projected to stay ahead of the pack throughout the forecast period. The APEJ paper and paperboard trays market is predicted to register a CAGR of 6.2% from 2017 to 2022. The dominance of this regional market may be attributed to the rapidly rising demand for environmental-friendly, cost-effective, and recyclable packaging applications for various end-use industries. North America market for paper and paperboard trays is projected to rise at the dominant CAGR of 6.4% during the assessment period. The regional market is forecast to rise from US$895.5 Mn in 2017 to US$1,223.8 Mn by 2022 end. The growth of the regional market is fueled by the vastly rising demand for resilient and customizable paperboard packaging in the various parts of the region. In addition, recent innovations made in the packaging industry is also providing a robust impetus to the market. Meanwhile, MEA is one of the most attractive regional markets, rising at a CAGR of 5.6% from 2017 to 2022. Several players are focused on developing high-performance paperboard trays for customizable and versatile applications, in order to strengthen their market positions. Prominent players operating in the market include International Paper Co., Huhtamaki Oyj, Mondi Group plc., ESCO Technologies Inc., Brodrene Hartmann A/S, UFP Technologies, Inc., Henry Molded Products, Inc., Pactiv LLC, OrCon Industries Corporation, and Fibercel Packaging LLC. The report on the global paper and paperboard trays market offers an in-depth evaluation of the various factors, including key regional and global trends, influencing the growth of the market. The study provides a comprehensive insight into current and emerging opportunities of various material segments and the competitive landscape. The research presents a detailed assessment of the factors affecting the demand of paperboard packaging among various end-use industries and estimates their share over the forecast period of 2017-2022. It takes a closer look at recent innovations in manufacturing technologies and offers attractive analysis of major product segments. The analysis highlights the various factors boosting major regional markets and the norms and regulations affecting the strategies of various market players. Offering a detailed intensity map region-wise, the report assesses the presence of key participants. The findings of the study can be a useful guide in identifying lucrative avenues in various geographic regions. The global paper and paperboard trays market is anticipated to expand at a CAGR of 5.8% during 2017–2022. The estimated valuation of the market is US$4,444.3 Mn by 2017 end and is predicted to reach a worth of US$5,893.9 Mn by the end of the assessment period. The key dynamics of the global paper and paperboard trays market entails insights into various trends and factors impacting the demand and supply in various regions over the assessment period. The study provides an evaluation of the intensity of the competition. Furthermore, the study offers a detailed overview of supply chain dynamics, prevailing pricing mechanism, cost structure, and raw material source analysis over the forecast period. A burgeoning ready-to-eat food segment, largely attributed to fast-paced lifestyle, is accentuating the demand for such packaging applications in numerous high-income countries. Furthermore, the advent of microwaveable paperboard trays and dual-ovenable packaging applications bodes well for the market. The launch of higher-quality paperboard containers with better product uniformity and thermal stability for a wide range of packaging applications is expected to bolster the uptake in major regions. The report offers an insight into the share and size of various material types and sources, end use, and regional segments. The analysis of the segmental growth also captures year-over-year (YoY) growth figures during the historical period (2012–2017) and offers evidence-based projections of the same during the forecast period. The report segments the overall paper and paperboard trays market on the basis of material type, end use, material source, and region. On the basis of material type, the report segments the market into corrugated board, boxboard/carton, and molded pulp. Of these, corrugated board is anticipated to be the leading segment throughout the forecast period. On the basis of end use, the study segments the market into food and beverages, consumer durables and electronics, personal care and cosmetics, homecare and toiletries, healthcare, e-commerce packaging, industrial packaging, and others. Based on material source, the market is bifurcated into virgin fiber and recycled fiber. Based on geography, the report segments the global market into Asia Pacific excluding Japan (APEJ), Europe, North America, Latin America, the Middle East and Africa (MEA), and Japan. Of these, APEJ is expected to lead throughout the forecast timeline. The study offers an extensive profile of various players, estimates their revenue share and size, and highlights the key strategies adopted by them to gain a better foothold in the market. Furthermore, the report provides a detailed list of distributors and analyzes factors shaping the competitive landscape in various regions. Leading companies profiled in the study are International Paper Co., Huhtamaki Oyj, Mondi Group plc., ESCO Technologies Inc., Brodrene Hartmann A/S, UFP Technologies, Inc., Henry Molded Products, Inc., Pactiv LLC, OrCon Industries Corporation, and Fibercel Packaging LLC.